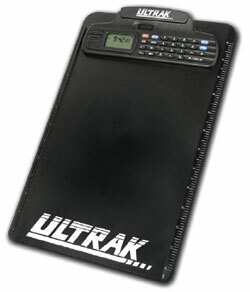 Calculator with memory, 1/100th second stopwatch, time single events and multiple splits, calculator and watch can operate simultaneously, includes ruler and straight edge, dual power (solar and battery). VS is sending me a new clip board and Ultrak also contacted me. They stand by their products and I'll have no problems ordering from either again. I bought one two months ago and the stopwatch and clock now don't work. How do you give zero stars?